The hero of Hanif Kureishi’s first novel is Karim, a dreamy teenager, desperate to escape suburban South London and experience the forbidden fruits which the 1970s seem to offer. When the unlikely opportunity of a life in the theatre announces itself, Karim starts to win the sort of attention he has been craving – albeit with some rude and raucous results. 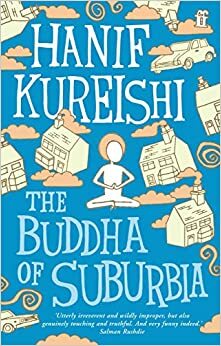 The Buddha of Suburbia is one of those books I neither love nor hate, hence the middling three star rating. It was an easy read that explores themes of identity, gender, belonging and racism. It didn’t take me long to finish it as it is a short book. It isn’t slow and doesn’t drag too much which probably makes it more palatable. The characters are painted quite vividly, which is one of the best aspects of the novel. I found I had a clear picture of the appearances and personalities of Karim’s family and friends as we pick them up along the course of the novel. This is a coming-of-age story in which Karim takes a path to find what he wants to do with his life. He spends a lot of time floating around between the houses of his family, sleeping here and there, but not seeming grounded. Is he grounded by the end of the novel? I’m not sure. It seems that at the end he is on the way to this place, but maybe hasn’t quite reached it. The book is supposedly a comedy. The cover is littered with quotes by authors and newspapers saying how funny it is. But obviously I just didn’t get it. There were some slightly amusing moments, hardly able to even lift a humoured smile to my face, and I certainly wasn’t laughing. Maybe I just didn’t get this kind of humour. It was at times rather odd. There are some strange people and some strange goings-on in this book. Maybe I didn’t get the 70’s references? Overall, the word to sum it up is average. I didn’t think it was anything particularly amazing but it wasn’t exactly bad either.